Set of 2 durable steel construction hangers incorporating "Simple is Best" functional concept. Two loop sizes create practical way to store and organize scarves, ties, belts, shawls, pashminas, accessories and much much more. Having where to hang your bags, hats, clothes and other accessories could sometimes be an issue, especially in a limited living space. Do you want to maximize your living space and adequately tidy up your closet? Then the specially designed TINKSKY hanger is what you need. 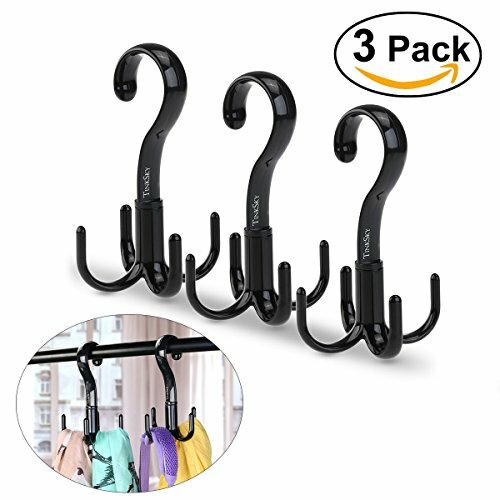 With the hanging hooks packed with four strong claws, there is suddenly enough room hang all your accessories in one place. 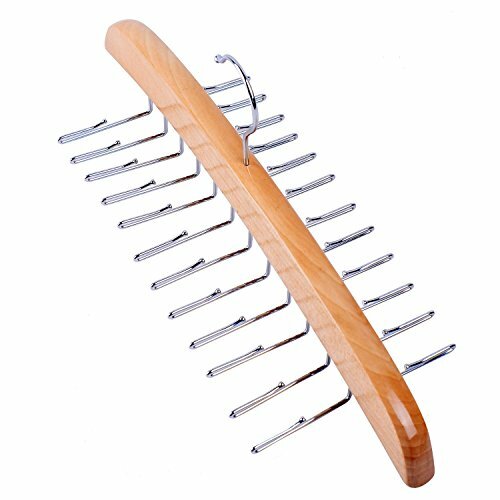 The TINKSKY 360 degree rotating four claws hanger is adequate as a tie holder, cloth hanger, purse hanger and tie organizer. With the three separate hooks with four claws each, categorizing and classifying your favorite stuffs just became easier. Now, you can easily arrange all your favorite accessories and cloths in one place without having to worry about them rumpling or crumpling. The TINKSKY 360 degree rotating four claws hanger is the magical closet organizer for you and your loved ones. With a good helper for a neat closet and home, what else do you need? Order now! Installations: 1. Insert the hook into the hole designated for hook bearing. 2. Put the gasket into the screw, stuff it into the supporting screw and then tighten with a suitable screwdriver. Precautions: Do not soak the hanger in water for a long period of time , refrain from exposing the hook to sunlight for a protracted period of time , take care not to leave the hanger near fire or close to high temperature. Package including: 1 x TINKSKY hanger (3 packs each), 1 x instruction manual. Made from quality polystyrene material, the 15x10cm TINKSKY 360 degree rotating four claw twirl is suitable for hanging belts, scarves, hats, umbrellas, bags, jewelries, ties, or other accessories. The TINKSKY 360 degree rotating four claw twirl is potable, lightweight and easy to install. These make it suitable and convenient for home or office use. It is also handy enough to be taken along on a trip, ensuring that you're organized, everywhere you go. With the 360 degree free rotating fingertip spinning, it is very easy to select items when needed. Simply hang over any closet hook or rod and enjoy the comfort and organization the TINKSKY rack provides. The TINKSKY rack is fitted with rivet screw connection which guarantees a maximum loading weight of under 3kg. The smoothly finished high quality plastic also ensures that your cloths never sag. We provide one-year 100% money back guarantee. Your satisfaction is our ultimate priority. Hence, to ensure that you get the maximum value for your purchase, we will send you a replacement or refund your purchase price if you become dissatisfied with this product for any reason. Having where to hang your scarves, ties, clothes and other accessories could sometimes be an issue, especially in a limited living space. Do you want to maximize your living space and adequately tidy up your closet? Then the specially designed WINOMO hanger is what you need. 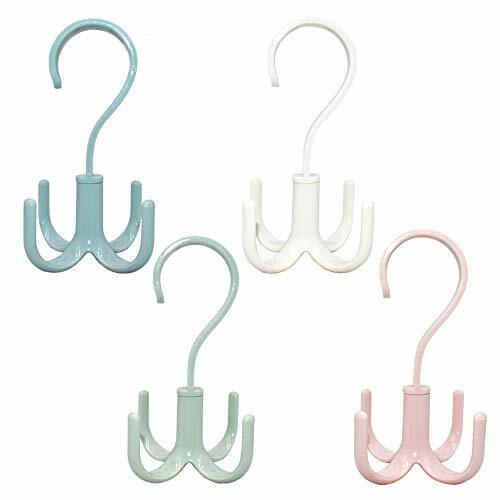 With this Multi-Purpose hanger hooks with 28 Count Hanger Rings, there is suddenly enough room hang all your accessories in one place. Maximize to save the space for you closet! - Material: Steel with rattan weaved yarn. - - Size: About 73x38cm. Customer Satisfaction is our main goal.Not satisfied with our product? Please contact with our customer service. 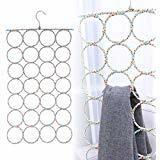 28 Hanger Rings & "STURDY": Designed with 28 durable holes in 1 single hanger, foldable feature for space-saving, ideal way to store and organize scarves, ties, belts, shawls or other accessories. SUPER EASY: Easy installation, super convenience to dry your clothes, pants and scarfs. Store scarves where you can see and easily reach them, hanging in your closet. Perfect storage solution - no more cluttered shelves, drawers or hooks (or piles on the floor!). Great tool for keeping rooms clean and tidy! 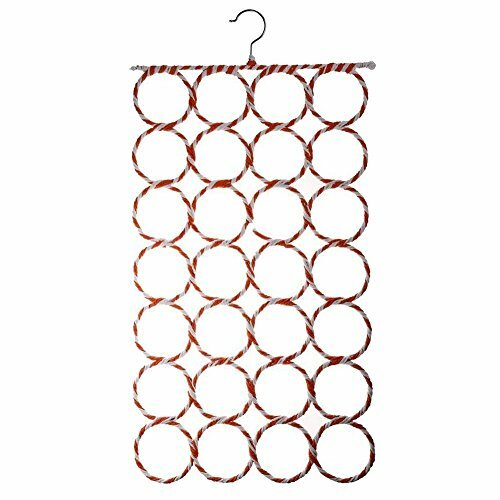 Material-This Hanger Organizer is made of Steel with rattan weaved yarn in continuous loops, looks colorful and garden style suitable for modern decoration. It also Ideal for retail fashion woman shops display, showrooms, and personal home use. 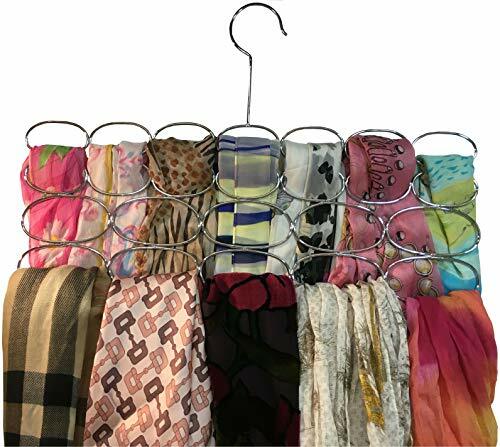 Order Now -- You will get 2Pcs high quality Scarf Hanger, 100% REFUND guarantee & Our friendly customer service. 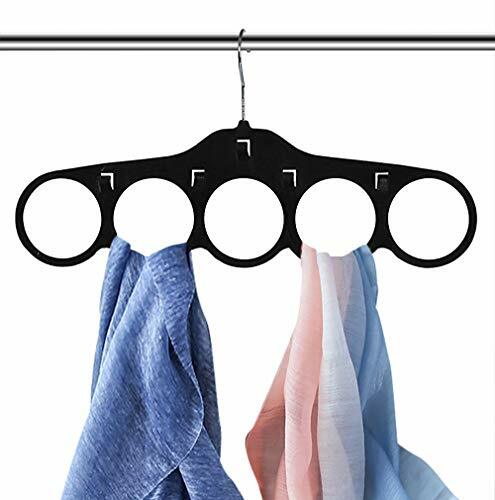 With the hanging hooks packed with four strong claws, make enough room hang all your accessories in one place. The hook can rotate at 360 degrees. Getting Clothes, hat, bag belts ties or jewelry is more convenient. Good for hand bags, purse hangers are ideal for getting your purses off the floor and organized and hidden away in a closet. Also great for storing your satchels, scarves, ties, belts, and other accessories. Sturdy construction that will last and provide ample support for your purse collection. The smooth chrome finish blends in well with any room of the house. Use in your kitchen pantry for holding shopping and grocery bags. Great for saving space in dorms, bedrooms, basements, and more. 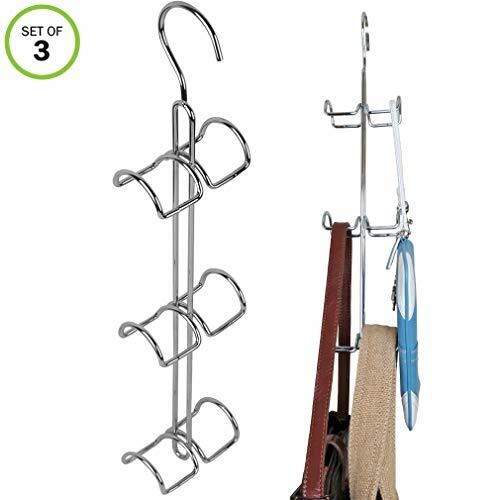 Comes as set and each hanger holds up to 6 purses. Each hanger measures approximately 3.25 inches L x 1.75 inches W x 15.5 inches H. No Hardware required. Good for hand bags, purse hangers are ideal for getting your purses off the floor and organized and hidden away in a closet. Also great for storing your satchels, scarves, ties, belts, and other accessories. Sturdy construction provides ample support for your purse collection. The smooth chrome finish blends in well with any room of the house. Great for saving space in your kitchen, bedroom, dorm, basement, and more. Each hanger measures approximately 3.25 inches L x 1.75 inches W x 15.5 inches H. No Hardware required. Please wipe the hangers with a wet cloth before using it for the first time to get rid of the linty velvet.Or you can dip it in water and then use a hair dryer to dry it easily. Description: 100% brand new and high quality. 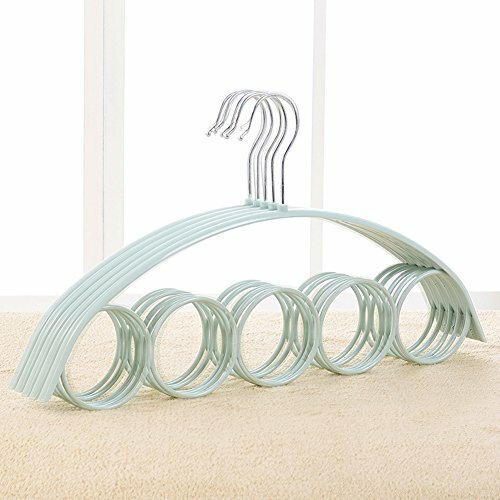 Super practical and durable scarf display storage holder. Easy to find and choose your items, can save your space Suit for shop display or your wardrobe to store your gadgets nicely Helping you organize shawls, belts, ties, straps, etc. Specifications: Item name: Scarf Hanger Color: blue, pink, beige, green Material: PP+Metal Size: 40*22.5cm(L*H) Weight: 45g Package Included: 5 x Scarf Hanger Note: 1. Due to the light and screen difference, the item's color may be slightly different from the pictures. 2. Please allow 1-3cm differences due to manual measurement. Super practical and durable scarf display storage holder.